Ramona Lisa Alexander and Jasmine Carmichael in Milk Like Sugar. Milk Like Sugar plays from January 29 – February 27, South End / Calderwood Pavilion at the BCA. Photo by T. Charles Erickson. BOSTON – Listen and learn. That would seem to be the motto of playwright Kirsten Greenidge, who grew up in Arlington and now lives in Waltham. It might help to explain her facility for writing dialogue or creating situations that ring true, whether its working class whites and upper-class blacks locked in a housing dispute in “Luck of the Irish,” or the young teens at the heart of “Milk Like Sugar,” her Obie Award-winning play now being produced by the Huntington Theatre Company at the Calderwood Pavilion of the Boston Center for the Arts. In an interview, Greenidge said the seed of the play sprang from news reports of a so-called “pregnancy pact” involving Gloucester teens. The pact turned out to be a hoax but it started Greenidge, who had recently become a mother, thinking about what it would have been like if she had had her child as a teenager still in school. Jasmine Carmichael and Shanae Burch in Milk Like Sugar. Milk Like Sugar plays from January 29 – February 27, South End / Calderwood Pavilion at the BCA. Photo by T. Charles Erickson. She apparently also spent a lot of time listening to young teens, and that times, coupled with the thoughts about teen motherhood, eventually became “Milk Like Sugar,” which was first presented at La Jolla Playhouse in 2011, eventually winning an off-Broadway Obie Award for Playwriting. It has been tweaked for this production, updating cultural references, including the latest and coolest cell phones and hip-hop dance moves, which would be impossibly dated just fjve years later. What hasn’t changed is the options available to the three female teen friends – a Pakistani-American named Talisha (Shazi Raja), a Latina named Margie (Carolina Sanchez), and an African-American named Annie (Jasmine Carmichael), a sophomore in high school who has just turned 16. When the three teens decide it would be great fun if they all got pregnant and had “tiny little babies” whom they could dress all the same, Annie must decide whether “go with the flow” and make a decision that will have dramatic consequences, or seek out her own way forward, perhaps inspired by family and friends. It’s about the choices we make, and the choices we make when there seem to be few other options, or when you can’t see far enough over the horizon to something else. When the three friends decide to get pregnant, Annie’s prospects for motherhood seem quite dim, even after a planned tryst with Malik (Marc Pierre), a senior with a troubled home life, goes awry. Malik is seemingly destined for college, and with his telescope urges Annie to look to the stars and the sky for inspiration because, as far as he’s concerned, the sky’s the limit. Annie looks outside her group for other role models that might point her in the right direction, and finds Keera (Shanae Burch), an upright and religious girl whose home life seems a model for where Annie would like to go. Annie suggests to her mother Myrna (Ramona Lisa Alexander) a true family dinner – including a father and two brothers never seen – or even a game night, the kind of family event that Keera routinely describes. Myrna had Annie when she was just a teen in middle school, and while she has aspirations of being a writer, is trapped in a dead-end cleaning job and dripping with frustration. A confrontation with her mother will seal the deal when it comes to the decision Annie makes involving Matthew J. Harris’ Antwoine, the tattoo artist who designed the tattoo her friends bought her as a birthday present. The title is a metaphor referring to the powdered milk that is often found in low-income homes. It feels and looks like sugar, is less nutritious and inferior to real milk, but you have it when, because of race or economic circumstances, you have to settle for something less than the real thing. Director M. Bevin O’Gara, the associate producer of the Huntington, has shown an affinity for working with promising young playwrights such as Greenidge and Brandon Jacobs-Jenkins, whose “Appropriate” she helmed at the Speakeasy Stage Company, as well as the young talent assembled for this production. The Huntington’s nonpareil group of designers always shines in using the infinitely versatile Roberts Studio Theater of the Calderwood Pavilion of the BCA, and Cristina Todesco’s set puts the audience on three sides of a chain link, gritty cityscape that suggests the characters hemmed in, with no chance of escape. As a playwright, Greenidge tends not to judge her characters or take sides for or against them. She presents them honestly and candidly, warts and all, and allows the theater-goer to think about actions, deeds and decisions. 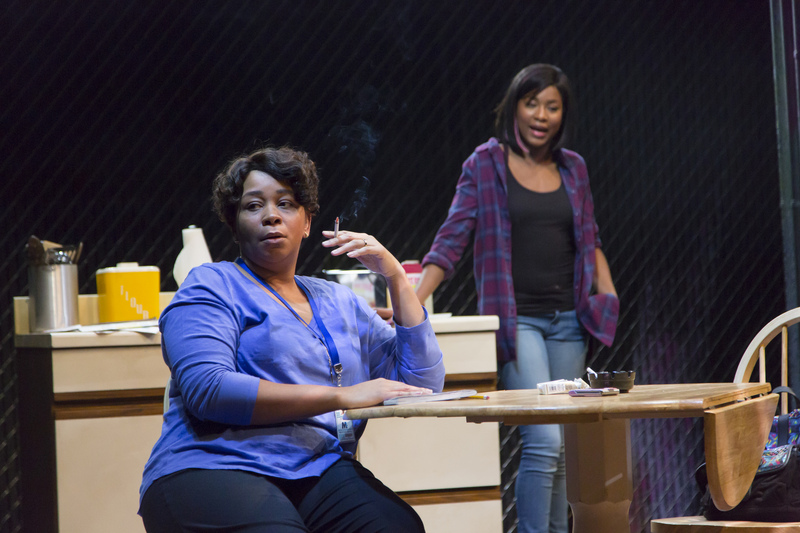 It is a winning formula, and I’m eager to see where she takes it in the future – specifically, the upcoming production of “Baltimore” co-produced by the New Repertory Theatre and the Boston Center for American Performance. 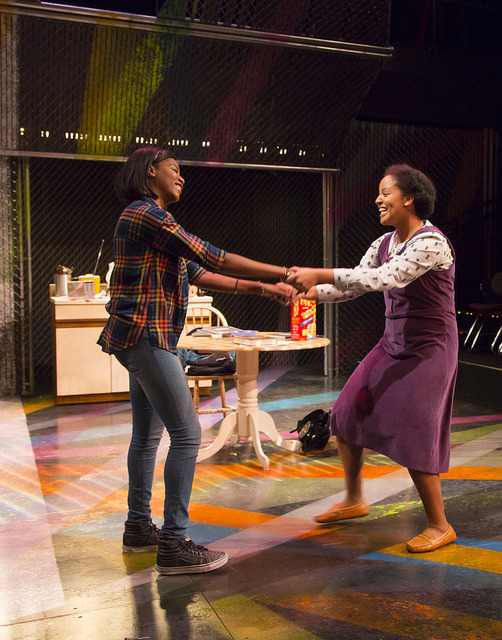 \The Huntington Theatre Company production of Kirsten Greenidge’s “Milk Like Sugar.” Directed by M. Bevin-O’Gara. Scenic design by Cristina Todesco. Sound design by M.L. Dogg. Costume design by Junghyun Georgia Lee. Lighting design by Wen-Ling Liao. At the Calderwood Pavilion of the Boston Center for the Arts through Feb. 27. huntingtontheatre.org.